They also cook a lot faster because they're so small. 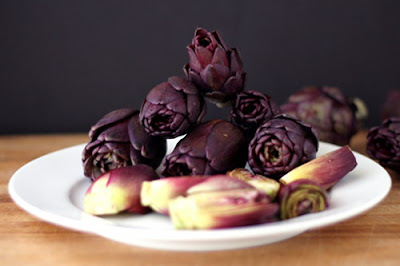 And the baby purple artichokes I got from Frieda's Specialty Produce were...well, purple. It's a pretty stunning color. You lose most of that purple when you trim off the inedible parts, but before you do that, they look really pretty. Even without the choke to remove, there's still a bit of cleaning that needs to be done, particularly if you want to use them in a salad like this one - you don't want to give people something with tough, inedible leaves. The trimming basically involves removing all the inedible parts - the tough leaves and the tips. If you've never cleaned an artichoke before, you can be a little bit conservative with the trimming at first, then finish trimming after the artichokes are cooked, since it's then a little easier to tell which parts are tender and which are tough. 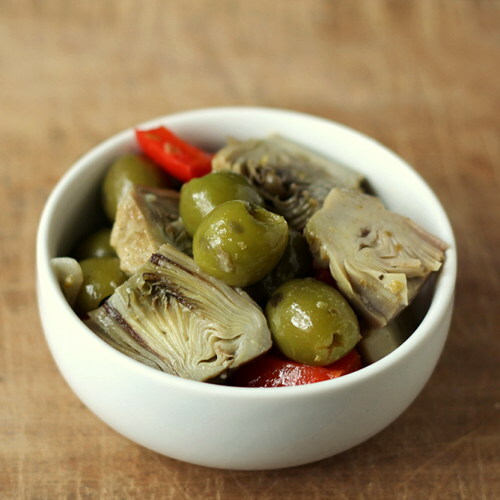 If you like, you can simply steam the artichokes and serve them warm with a little lemon olive oil, but I like the idea of a cold salad. It's a great little nibble. The olives here are kind of interesting. They're a green olive, but they're ripe, so they taste a lot like black olives. Give them a try if you ever see them at your local store. Remove the tough outer leaves from the artichokes, trim off the tough tops of the leaves, cut the artichokes in half, and drop them into the cold water - this acidulated water keeps the artichokes from turning brown on the cut edges. Heat the Mission olive oil on medium heat. Add the onion, pepper, salt, and oregano. Cook, stirring as needed, on gentle heat until the onions have softened - you don't want them to brown, just soften. Add the cooked artichokes and olives and cook for another minute. Remove the vegetables from the heat, add the lemon olive oil, and stir to combine. Transfer to a storage container and chill. Taste for seasoning before serving and drizzle with more lemon olive oil, if desired. Serve chilled.